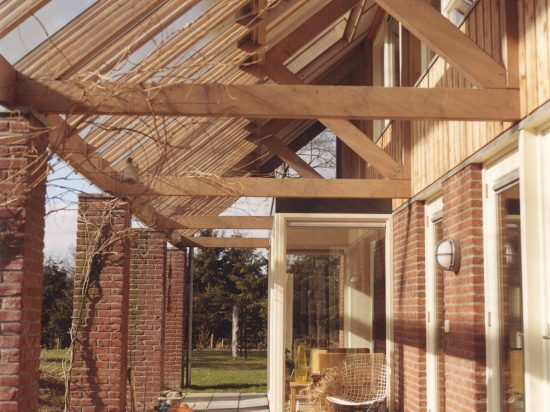 "The house is a reference to the past"
After living in Rotterdam for a long time, Toon van der Hammen and his wife, Ineke Noordhoff, exchanged the turbulent Randstad for quiet Midlaren in 1999. 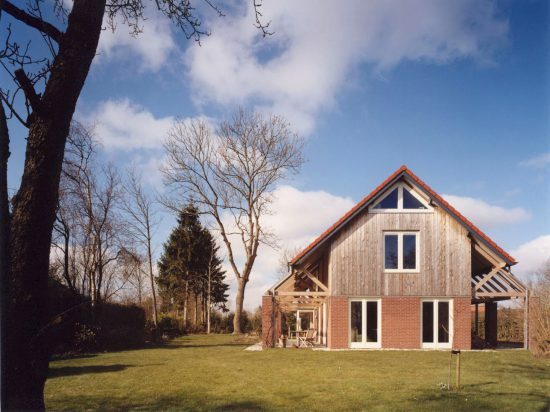 They fell in love with the natural surroundings and bought an old, derelict farm on the outskirts of the village. It soon became clear that they wanted to have a new house designed by an architect who really understood their wishes. It was especially important that the design would fit in with the surroundings. ‘When we started living here, there were mainly old homes in the village. A modern house wouldn’t have suited the surroundings. It could surely be a striking design, but it had to be conservative in a certain way as well. 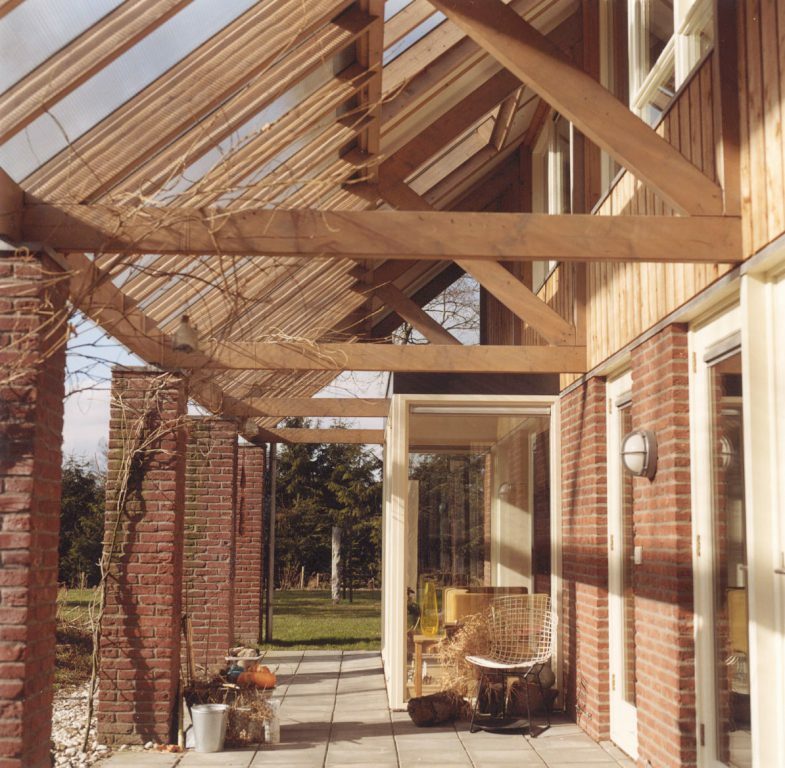 Pieter did this very well, especially with the choice of materials,’ Ineke says. The house consists of a number of different rooms that separate all the functions from each other. Ineke had thought about this long and hard. ‘Even as a young girl, I had a kind of sketch in my head of what my house should look like. I wanted separate spaces to live, work, sleep and cook.’ The kitchen and two offices are on the ground floor. The bedroom and living room are on the upper floor. 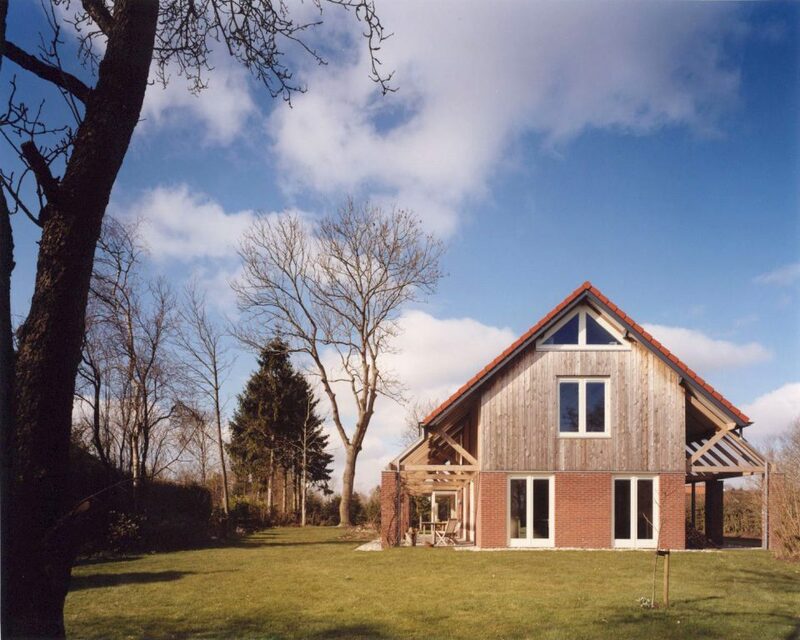 ‘When we started building we had a lovely view on the upper floor. That is why Pieter decided to place the living room on the first floor’, Toon says. Even though Brink took the surroundings and the history into account when creating his design, the house caused a bit of a stir in the village. ‘People thought it was a weird house. When the pillars were placed on the side of the house, a passerby said: “Look, a house with soldiers!” But there are also people who ring the doorbell and ask if they can take a look inside, because they want the same kind of house,’ Ineke says.